This page includes information on current international development activities. Other projects are in various stages of grant submission, detailed planning or concept stage. Contact the ERS International Development Coordinator, Professor John Gibson for information about projects that are in planning phase. The Government of Indonesia sees the integration of cattle with oil palm and crops as a means for increasing the cattle population and beef production in Indonesia. In response, two projects have been developed to strengthen Indonesia's community-based beef sector and to improve the livelihoods of smallholder cattle producers. Collaboration between the University of New England and the University of Southern Queensland. The overall aim of the project is to reduce poverty in the Eastern Gangetic Plains (EGP) of Bangladesh, India and Nepal, by improving the productivity, profitability and sustainability of smallholder agriculture. The goal of this project is to develop and evaluate an adult-learning approach to improving crop productivity and farmer livelihoods in the CDZ of Myanmar and improving the role and status of women in agricultural decision making. Establishing farmer groups to be involved in participatory crop benchmarking will provide an effective research and extension framework to improve crop productivity and farm household profitability. In addition, this project aims to develop a culture of participatory research and extension among farmers, DoA and DAR participants and will monitor the effectiveness of this approach. The project will address gender issues through advancing the involvement of women in decision making affecting crop production. Part of a themed ACIAR project to address agriculture and fisheries in Myanmar. There is increasing demand for high-end consistent quality of beef into the Urban markets in Cambodia and southern Vietnam. 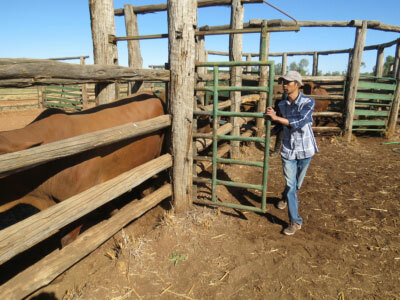 At present market access for Cambodian cattle is constrained by a number of factors including growing requirements for local and international biosecurity, lack of market information and lack of capability to produce the required quality and quantity of product. This 4 year project (ACIAR Project AH-2010-046) aims to support the development of a market chain that encourages smallholders in South East Cambodia to access the Ho Chi Minh City, Phnom Penh and Siem Reap markets. The project will work with selected traders in Kampong Cham and Pursat provinces and their individual clients and communities. The project will work directly with medium size traders (trading 30-50 cattle per day) in Market Chain Development Groups (MCDGs) and their respective collectors, farmers, depot operators and retailers. The project will trial the development of a 'clean market chain' whereby branded cattle from SE Cambodia will be sold for premium prices in urban supermarkets. Underpinning this strategy is the principle that sustainable market chains ensure that all stakeholders in the market chain have economic incentives to work with smallholders to improve management of biosecurity and production. In the first two years the project will develop a generic methodology for analysing market chains, identify present limitations to smallholder involvement in developing markets, and identify potential interventions. In the third and fourth years agreed interventions for improved animal health, biosecurity, animal production and market chains will be tested and evaluated. Is biochar a sustainable use of rice residues compared with alternative uses in northern Vietnam? Collaboration between the University of New England and Thai Nguyen University of Sciences. This research project focuses on underpinning technical interventions with sound extension and livelihoods research to achieve adoption and livelihood change beyond case-study communities. 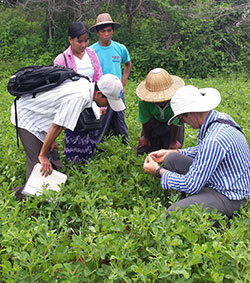 Collaboration between the University of New England, Queensland University of Technology, and the Bangladesh Agricultural Research Institute. NW Cambodia has seen an increase in the area of maize from 14,000 to 150,000 ha between 1999 and 2009. 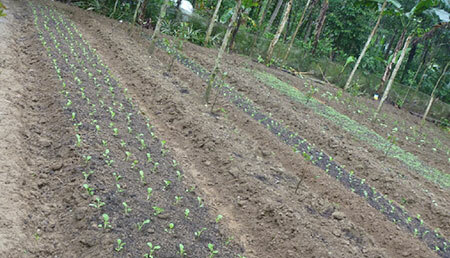 This has resulted in reduced crop diversity, declining soil fertility and erosion. Expansion of cropping has coincided with a 20% increase in the cost of farm labour since 2004 resulting in transition to tractors for cultivation and planting crops. Now only 5% of cattle are used as draught animals compared to the national average of 28%. Despite this, cattle numbers are increasing in the region - associated with increasing demand for beef. With an ample supply of crop residues and potential for production of forages, there are opportunities for profitable beef production from cattle in the region. This project will shift the focus from subsistence-based food security interventions to sustainable food security through diversification, generation of cash income and commercialisation. The engagement of the commercial and education sectors as well as research and extension providers will ensure development and delivery of viable alternative commercial crop and livestock enterprises. The project builds upon previous upland cropping systems projects ASEM/2000/109 and ASEM/2006/130 and the cattle projects AH/2003/008, AH/2006/025 and AH/2005/086 which developed improved crop-livestock component technologies and practices leading to potential further gains by integrating crop and livestock enterprises. The project will work with AH/2010/046, focused on SE Cambodia, for development of cattle market chain, improved management systems and on-farm biosecurity. Identify and explore potential for intensification, processing and marketing opportunities in NW Cambodia through an understanding of the livelihood and operating environment of current and alternative whole-farm crop-cattle production systems. Review current soil status with regard to degradation under the range of existing farming systems and identify crop-cattle management options that meet economic, social and environmental goals in NW Cambodia. Evaluate opportunities and technologies for Cambodian crop-cattle production systems in the context of declining soil fertility in partnership with 200 focus households. Assess and develop options for adaptation to climate variability and climate change for crop-cattle farming systems with 200 focus households in NW Cambodia and with existing CMA farmer groups in CW & NW NSW, Australia. The project will enhance networks and learning between farmers and other stakeholders in the value chain from input supply to production to marketing. Researchers and farmers, will identify and evaluate opportunities for integrated crop-livestock systems. On-farm biological, physical and chemical data will be collected to better understand the reasons why farmers are not achieving crop/livestock production potentials that were measured and achieved on-farm in previous projects. In crop-cattle enterprises in NW NSW, best practice conservation farming systems have been developed to respond to climate variability but more needs to be known about how resilient these practices will be in the face of climate change. The project will collaborate with CMAs and farmer groups to develop climate change adaptation strategies. Collaboration between the University of New England, Thai Nguyen University of Sciences, and the Institute of American Education, Vietnam. Training and research into age-growth, spawning and habitat use in key cichlid and catfish species along the Okavango River system, northern Botswana. 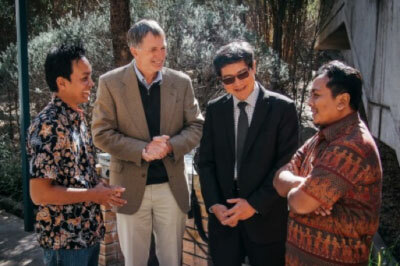 This course is funded by the Indonesia-Australia Partnership on Food Security in the Red Meat and Cattle Sector under the Australia Awards program. 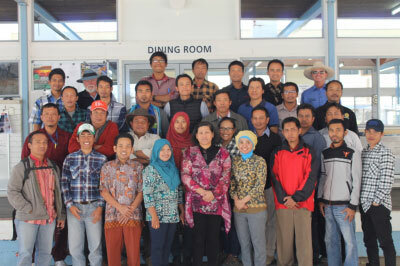 Thirty Indonesian cattle industry professionals participated in the Animal Husbandry and Cattle Production short course held between April 11th and May 23rd, 2015. The course was run by the University of New England (UNE) in collaboration with the Queensland Agricultural Training College (QATC). 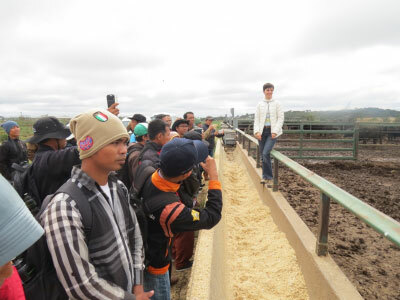 The participants came from 15 provinces across Indonesia and included representatives from smallholder systems, state run animal production facilities, and large commercial enterprises. They spent 6 weeks in Australia working and interacting with a wide range of commercial enterprises, industry bodies, service providers and other stakeholders involved in the Australian cattle industry. Formal training sessions were delivered by UNE experts as well as staff from Meat and Livestock Australia, Animal Genetics and Breeding Unit, the Australian Agricultural Company; Rangers Valley Feedlot; the North Australian Pastoral Company, and a variety of other organisations.